Calder JL. 2014. Weaving through the matrix: Investigating the influence of urban land use on weaver bird movements into and out of Cape Town wetlands. MSc, University of Cape Town. Abstract. Urbanization, a fast growing and destructive human land use, causes local extinctions, biotic homogenization and fragmentation of natural habitats. Understanding how the nature of the urban matrix affects the species residing within a cityâ€™s fragmented habitats is an important founding component of urban conservation. 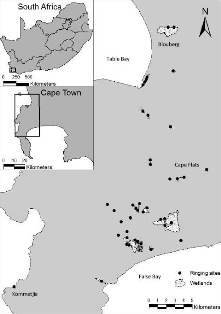 This study investigated the influence that the urban matrix, as well as patch isolation, size and quality, had on weaver bird movement into and out of wetland sites in Cape Town, a growing city within a global biodiversity hotspot. Weaver bird movement data from 42 wetland sites were obtained through a long term mark-release-recapture project. Distance-based linear models revealed that site proximity was important as a predictor of weaver movement into and out of sites, while the site variables (wetland size, bird abundance and weaver colony size) had limited and inconclusive influence. Once the variation explained by the proximity and site variables had been accounted for, the composition of the urban matrix and the presence of rivers as potential movement corridors (measured at three spatial scales) had little influence on weaver movement. The finding that proximity (or site isolation) influences weaver movement has important implications for maintaining current landscape connectivity. Habitat isolation, resulting from further habitat removal or destruction, could be expected to reduce movements of weavers, and potentially other species, among patches of favourable habitat. Weavers are robust, vagile birds that do well in the presence of humans and may not be highly sensitive to the nature of the urban matrix. Research into how other, less resilient and vagile species respond to the degree of urbanization in the matrix between wetlands would contribute further to our knowledge of urban biodiversity in this global biodiversity hotspot.